Our Menace M-Class crew took on a new and exciting challenge over the weekend when they ventured to Sydney’s Pittwater to race in the inaugural One Design MC38 Australian Championship. Howard Spencer, the man at the end of the magical wand, otherwise known as the tiller, unfortunately a wheel on the charter boat, said that his entire RAYC crew had a fantastic time under the guidance of their Aussie competitors, more so at the RPAYC bar than on the race track. “It was bloody good fun. It’s hard for us to say that the Aussie’s are just one step ahead of us (at the moment), but we definitely aren’t scared of them, it was a challenge to step straight into a boat you’ve never raced before & only sailed for a few hours. However we pulled a couple of second places out of the bag which was a shock to them, maybe it was the time difference as it was the first race of each day. [Faire] managed to lose 7kgs in 24 hours after running laps in this wet weather gear in 30 degrees of heat. That was quite funny to watch. Our big man Anatole [Masfen}] has slimmed down by a curvy 10kgs! It did distract us from our training day for sure. (The combined crew weight cannot exceed 600kgs, owner / driver weighs in at 90kg regardless). 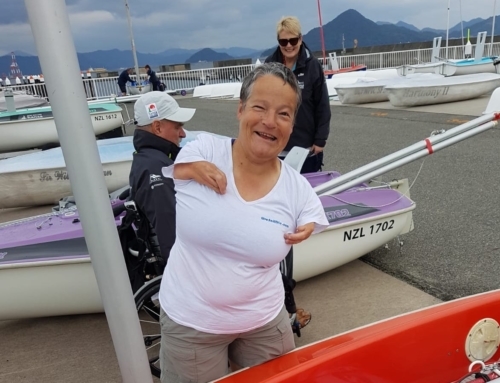 “My wife Frances experienced her first regatta as an actual member of the on water race crew which was pretty exciting for her. “We went to learn before the new boat arrives and we did, the Aussies also taught us a lesson or two – but we dominated where it mattered. Menace arrives in Auckland early January and will hit the water once commissioned and all things being equal the team will be representing the RAYC from mid January at BOI race week and harbor racing with the intention to return to Australia and seek better results in this new, exciting and competitive one design fleet. An amazing weekend was had by all of the MC38 Fleet out on Pittwater in the Sevenstar International MC38 One Design Championship, John Bacon and his crew on Dark Star, battled it out over the seven races to take home the inaugural Championship Title. Five MC38s took to the starting line on Saturday morning, for some exceptional racing on Pittwater. John Bacon’s “Dark Star” took the first race, but saw exactly how quickly the tables could turn in the close racing when Leslie Green steered his crew on “Ginger” to take 1st in the second race. The Howard Spencer and his Kiwi team “Menace” enjoyed themselves, having only sailed the MC38 once before, they had a great time and can’t wait for the next event. It was a testament to everyone who sailed on the weekend; it was very close sailing, all putting a brilliant show for the spectators that came to watch. 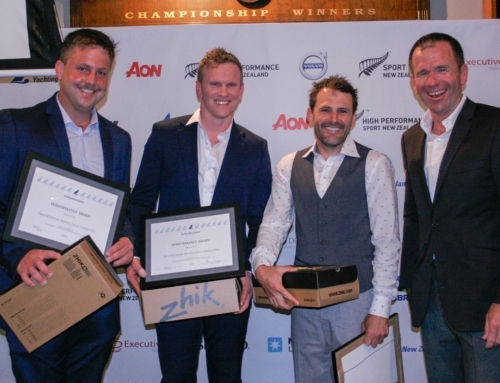 In John Bacon’s acceptance speech he thanked everyone for coming out and competing, McConaghy Boats, the Sponsors, Royal Prince Alfred Yacht Club and his crew including Cameron Miles who left straight after the presentation for the birth of his third child. The MC38 Class is working on the calendar for the next 12 months and expects to see the next race in March next year.